The barnacle plots at Point Fermin consist exclusively of Chthamalus dalli/fissus (note that species were not distinguished until 2001). Cover of Chthamalus typically varied inversely with rock cover, with relatively little else occurring in these plots. When this site was established in fall 2009, mean barnacle cover started out around 60%. Then it declined to around 40% by 2003, rose to nearly 80% by 2005, and declined again after 2006 to around 25% In recent years barnacle cover has evened out in the 30-40% range. Motile invertebrate counts at this site began seasonally in the fall of 2000 and were changed to annual sampling in 2004. Littorines were added to the protocol in the fall of 2001. Within the barnacle plots, littorines have been highly abundant, consistently in the neighborhood of 1000 individuals per plot. Limpets have also been common with up to 50 individuals per plot. Limpet abundance declined in 2010 but rebounded thereafter. Mussels have declined substantially at the Point Fermin monitoring site. Mytilus cover in and around the mussel plots started close to 100% at site inception in 1999, but immediately began a steady decline leveling off at around 15% by 2003. The plots have remained largely unchanged since that time. Three plots became completely devoid of mussels (except for a few small isolated recruits), while one remained steady at around 70% cover and the last plot contains one small persistent patch of mussels. These plots are representative of the surrounding reefs as widespread mussel bed contractions have occurred at this site, a phenomenon that has been reported elsewhere in southern California. As the mussel bed contracted, bare rock and barnacles became more prevalent, as did the cover of species that do not appear in this graph (Tetraclita, Lottia gigantea, chitons (Nuttalina sp. ), crustose algae, articulated coralline algae, and others). Caulacanthus also invaded the lower and wetter portions of these mussel plots as that introduced and invasive alga spread throughout this site several years ago. As indicated above, a small number of mussels have recruited into the plots since the decline, but these have never survived beyond a season or two. The data from the motile invertebrate sampling show that limpets, chitons (Nuttalina sp.) and shore crabs (Pachygrapsus crassipes) were all present in the mussel plots prior to the decline, each with an abundance of around 10 individuals per plot. As mussels declined, limpet abundance increased dramatically to around 1000 individuals per plot while shore crabs have declined on average, with sharper declines in 2010 and 2013. Chiton abundance has remained steady. 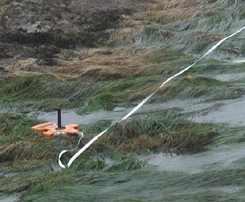 The sampling of littorines began in 2006. Littorine abundance in these mussel plots has remained generally low with less than 10 individuals per plot on average. Sampling of limpets and littorines in these mussel plots ceased in 2014. 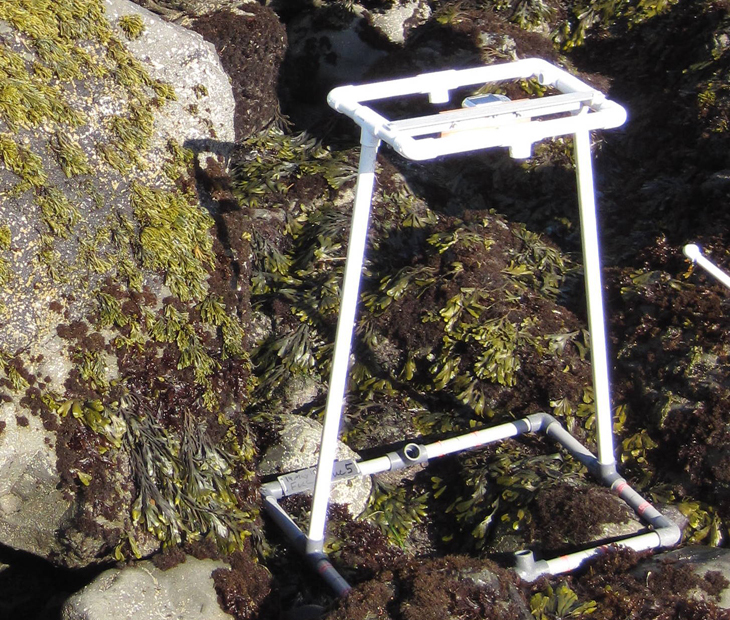 Within the rockweed plots, Silvetia has been seasonally variable (lower in spring and higher in fall) with the mean cover remaining steady near 100% (fall highs) for the first 5 years of sampling. Starting in 2005, the cover started to decline gradually with fall highs dropping first to around 90% and then to 80% by 2009. After that, cover continued to decline to about 50% by 2013, then to its lowest level (below 40%) in 2014 with no fall season rebound. Initially, much of this decline was due to a single plot which had dropped to less than 50% cover by fall 2010 and has declined further to less than 20% in subsequent years. The other four plots remained in the 70 to 90% cover range (fall highs) for most of these years; however, three of those plots dropped likewise to 20% cover in fall 2014. As Silvetia has declined, bare rock has become more prevalent in these plots, as have crustose algae and the invasive species Caulacanthus, none of which appear in this figure. 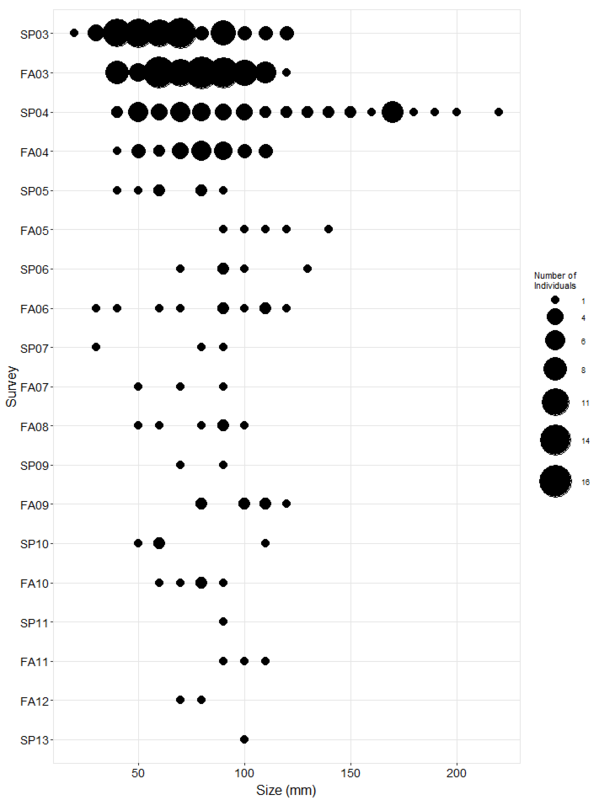 Motile intertebrate counts within these plots show that Cyanoplax spp. chitons are common under the rockweed canopy. In the early years, these chitons exhibited seasonal variation in synchrony with Silvetia cover. Following the switch to once-per-year sampling, the spring abundance has proven reasonably stable despite declines of Silvetia. Hermit crab (Pagurus spp.) numbers were high and variable during the early years but then dropped to zero by 2004. Meanwhile turban snails (Tegula funebralis) displayed an opposite trend with their numbers growing in recent years, and limpets have likewise become more abundant (and also more variable) in recent years. Rock ("Above Barnacles") plots were added to this site in the fall of 2008 to document any upward spread of intertidal species as a result of global climate change or other factors. These plots are expected to remain dominated by bare substrates unless barnacles or other species begin to encroach upon them. From their inception, a few barnacles have been recorded within these five plots, most of which were present inside cracks and fissures within these plots. While there have been a few recruits, barnacles have yet to spread out onto open surfaces. Littorines have been increasingly common in these rock plots. The mean cover of Surfgrass (Phyllospadix spp.) at Point Fermin has shown seasonal variation (lower in spring, higher in fall) with moderate fluctuations in cover between about 60-80% (fall highs). Over these years the extreme range of cover documented has been between about 20% (Spring 2000) and over 80% (Fall 2013). Algal species have also shown seasonal variation with Egregia cover generally following Phyllospadix cover (though with lower seasonal swings), and red algae and articulated corallines displaying the inverse pattern (cover increasing when Phyllospadix is lower). Sea star (Pisaster ochraceus) plots were added to this site in the spring of 2003 and consist of three large irregular plots surrounding an area of medium relief rock which includes several cracks and ledges. Seastars were common at this site when these plots were initiated, but declined steadily over the next two years such that just a few stars have been counted and measured each season since 2005. These plots are representative of the site as a whole. In recent seasons, sitewide searches turned up just a few additional seastars. 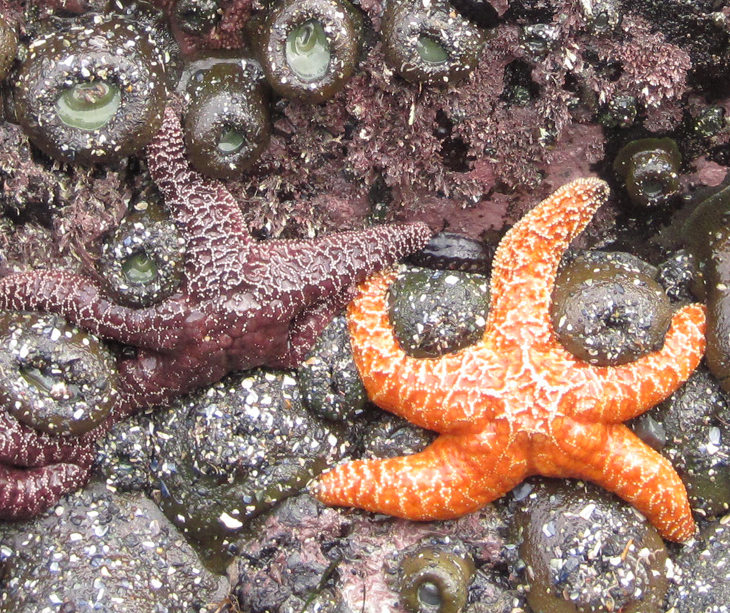 The seastar wasting disease struck this site some time in advance of our fall 2013 sampling. There were local reports of diseased stars subtidally during that preceding summer, and the disease had struck the population of seastars at the Cabrillo Marine Aquarium. During our Fall 2013 sampling, no seastars could be found at the site, either in the fixed plots or in sitewide searches. Subsequent sampling events had yielded zero stars at the site through Fall 2014. The size frequency figure indicates that the large number of seastars found during the first sampling seasons, in part, may have been the result of a large recruitment pulse occurring sometime in the preceding years. Recruitment has been low since that point but has, along with potential migration in and out from the adjacent subtidal, helped to keep the numbers of seastars above zero at this site…up until the point where the seastar wasting disease arrived.